A woman who died while living in her parked car off Eastbourne seafront has been identified. An inquest at Eastbourne Town Hall today (Thursday) heard Petina Hall, 52, was originally from Ascot but told police she liked to travel and often slept in her car. 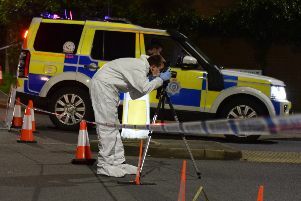 She was found dead in her parked car in Silverdale Road, near the Grand Hotel, by a carpenter working in the area in May. At the time residents raised the alarm and said they were concerned not enough was being done to check on her welfare after she was spotted sitting in her car for days on end without appearing to eat or drink. Brenda O’Brien, of Silverdale Road, said she had called social services and police on May 13. Christine Hedges, who also lived nearby, said police told her there was nothing they could do as she wasn’t doing anything illegal. She said, “Nobody seemed to want to know, they just passed the buck. Inspector Rachel Barrow said at the time, “We had received some reports from the public recently concerned about the woman who appeared to be staying in her car. “Officers had spoken to her and checked her welfare. She said she was staying at a local hotel and enjoying the area for a few days. Coroner Alan Craze concluded Ms Hall had died of natural causes.